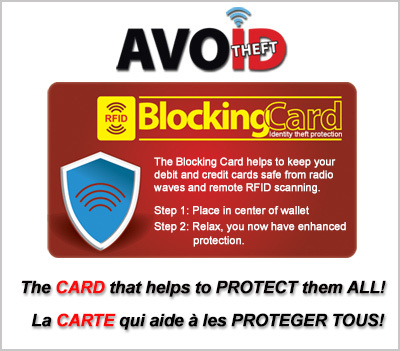 The Blocking Card adds another layer of protection in helping to keep your credit and debit cards safe from radio waves and remote RFID scanning. Drawing energy from any RFID scanner within range, the Blocking Card instantly creates a surrounding electronic field making all 13.56MHz cards virtually invisible to scanners. Visit www.BlockingCard.ca for more details. Inches: 3.36" x 2.12" x 0.04"